- Tacko ate our lunch inside. We held him to 10 points and got him in foul trouble, but when he was on the floor the game changed. I believe all of his points were on dunks... and before every one of them when he grabbed the ball he'd smile then go back up and dunk. - Petty's woes... he has no confidence and neither do I in his game. - Dominate the boards... despite a 7'6" monster we outrebounded U Can't Finish by double digits. Never could finish though. - pathetic from 3. This team neither has a real inside game or an outside one. U Can't Finish's D outside of Tacko was not the story that night. - Outsucking the opponent... we did that in splendid fashion. - Bright spots in Donta, Kira, and Jason. - Going after Tacko to get him in foul trouble was good strategy IMO... and while it worked the team decided to become an outside shooting team. Kinda puzzling to me. - Brown(?) from UCF... quite possibly the 2 worst FTs I ever saw live. Made Tacko look like John Stockton from the line on those. 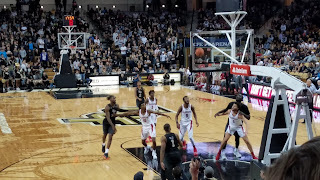 - Dumb chant... after UCF sinks a FT their fans yell, "SWISH! UCF... BALL IN!" - I agree that this game is on the coaches... UCF was not at their best and we just happened to out-worse them. - I would guess there were about 50 Bama fans at the game. 1) My seats,,, BTW this is a great facility. Well lit, spacious, and the seats were comfortable even if they sat a bit low. If the proposed remodel of Coleman in 2098 is anything like what UCF has at the CFE Arena I'd be impressed. I'll also be dead by then, but FACTS. 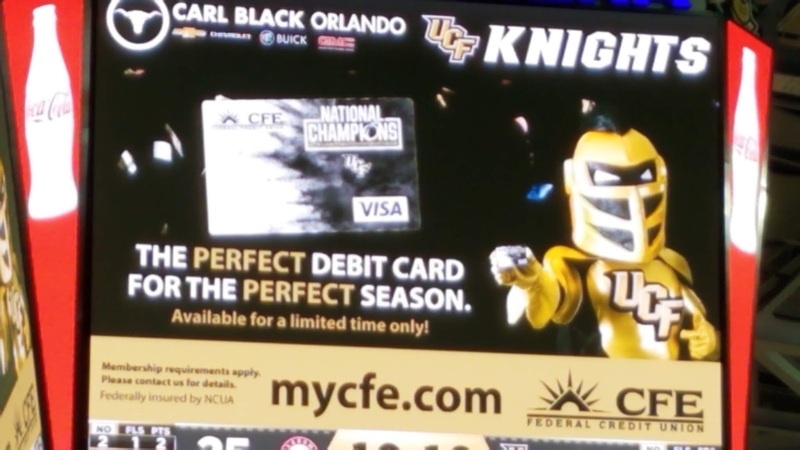 2) Shake your head at this one... says National Champs on the Credit Card. I was tempted to buy one of their "National Champs" hats, but decided against it. - Despite my jab above, this school is not leaving the national stage as the investment in infrastructure and sports is something to behold. The AAC should hold on to them for grim life as I can see UCF ending up in a Power 5 in the next decade. There is A LOT OF MONEY pouring into the school. It is a beautiful campus... far different than it was back in the late 80s or even early 90s. It's not going to be just a football school... they are determined to be competitive in every sport.